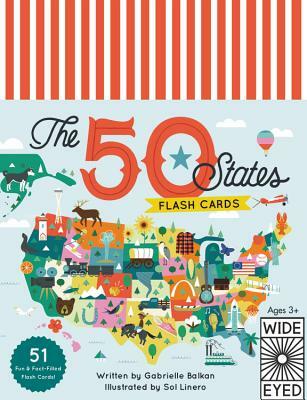 The ideal companion to the 50 States Memory game, this delightful collection is a great way to stimulate learning and explore the fun-filled facts of the 50 states! The colorful illustrations make this a seamless teaching tool to encourage young minds to explore the history, people, and culture of the United States of America. The 7 x 9 50 flashcards come in a sturdy storage box and are printed on heavy laminated card-stock for display and play. Each card features the outline of a state and its state flag on one side, and a list of facts, questions and answers on the other. Discover quirky facts, famous faces, big cities, and more. The 50 States - Flashcards is a fun and interactive way for children to learn about each of the nation’s 50 states. Special attention is paid to the inventiveness, beauty, and diversity of the United States, so that your child will be able to enjoy uncovering each card.